Written documentation is required to help buyers with installation and setup. Pagewiz has provided the following guidelines to assist you in this. 1. Don’t have a Pagewiz account yet? Sign up for a FREE account right now. If you do have one, sign in at http://cp.pagewiz.com/Login. 2. From the main control panel click the down arrow to the right of “Create New Landing Page.” Then select “Import from file". 3. From the resulting pop-up window select your file then choose “Upload”. Follow the ThemeForest General File Preparation Guidelines. Submissions must be a zipped .Pagewiz file exported from the Pagewiz platform. 1. From the control panel, first publish your template. 2. Now select “Page URL” from options. 3. Copy the default URL, or customize the link by selecting “Click to Change”. This will be the URL used for your ThemeForest demo. 4. 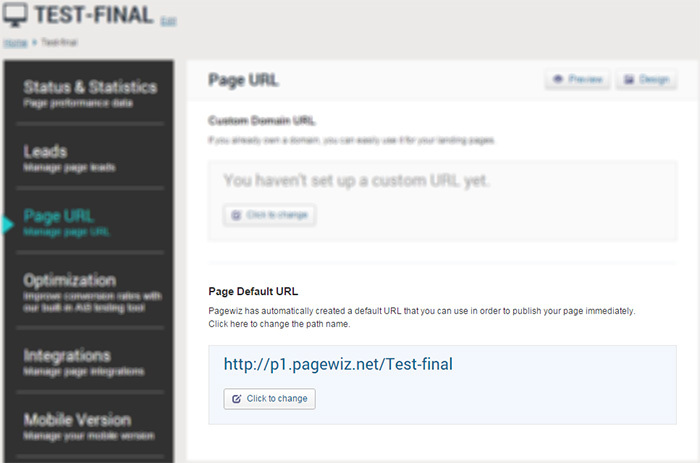 To download your .Pagewiz file, select “Status & Statistics” then click on the “Export” button to the right. This is the file you will include in your ThemeForest upload.